Vivo V1901A / V9101T Full Specifications Leaked Through TENAA Listing - Playfuldroid! The Vivo V1901A / V1901T smartphone has bagged approval from the TENAA authority. The V1901A/T’s TENNA appearance has revealed its entire specifications along with images. However, the exact identity of the phone is under the wraps. 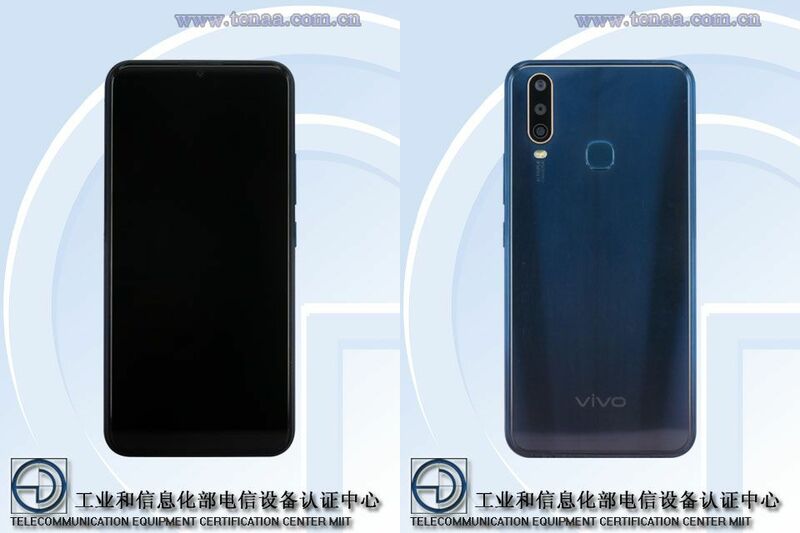 The Vivo V1901A/T images reveal that the smartphone will be featuring a waterdrop-style notched display. The back panel of the phone has a vertical dual camera setup is placed at the top-left corner. A fingerprint reader is also available on the rear side of the smartphone. The smartphone may hit the Chinese markets in color options such as Blue and Gold. The Vivo V1901A/T houses a 6.35-inch display that delivers HD+ resolution of 720 x 1544 pixels. The MediaTek Helio P35 with 2.3 GHz octa-core processor powers the smartphone. The handset is expected to hit the Chinese markets in variants like 4 GB RAM + 64 GB storage and 4 GB RAM + 128 GB storage. Thee is a microSD card slot on the device for more storage. The smartphone comes loaded with Android 9 Pie that could be overlaid with the latest version of FunTouch OS. The Vivo phone comes packed with a massive battery of 4,880mAh capacity. Good thing is that it is equipped with fast charging support. The rear shell has 13-megapixel + 8-megapixel + 2-megapixel triple camera setup and on its front is a 16-megapixel selfie camera.